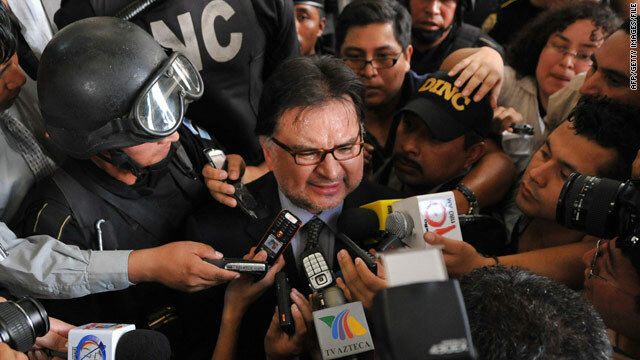 Former Guatemalan President Alfonso Portillo talkes to reporters outside court in Guatemala City in 2008. (CNN) -- Former President Alfonso Portillo of Guatemala faces money-laundering charges in the United States, according to a federal indictment unsealed Monday. The indictment charges Portillo with embezzling tens of millions of dollars in public funds, "a portion of which he then laundered through bank accounts located, among other places, in the United States and Europe," the indictment says. A grand jury indicted Portillo in U.S. District Court in New York. Portillo engineered an embezzlement with co-conspirators that occurred from about 2000 through about 2003, the indictment says. Prosecutors allege the money-laundering took place through at least 2006. Portillo was the president of Guatemala from 2000 to 2004. Authorities in Guatemala started searching for him after the United States requested his extradition, a spokesman for the International Commission against Impunity in Guatemala told CNN en Español on Sunday. They executed search warrants in four locations but had not found him as of Sunday night, officials said. Portillo came into power promising to clean up corruption, but found his own government mired in the same accusations as his predecessors. According to the indictment, in one instance in 2000, Portillo funneled $1.5 million worth of donations for a literacy project from Taiwan into accounts in Europe controlled by his ex-wife and daughter. In that case, the indictment alleges, Portillo endorsed three $500,000 checks destined for a program to purchase books for libraries, but diverted the funds into a bank in Miami, Florida. That money was eventually laundered into his family's accounts in Europe, the court document states. In short, "this money was diverted, in a series of transactions and transfers designed to conceal the sources and origin of the funds," the indictment states. There was a second instance where Portillo allegedly embezzled money given to Guatemala by the Taiwanese, according to the document. In addition, Portillo is accused of embezzling money from his defense ministry in 2001. With the help of others, Portillo made large cash transactions that ended up in accounts belonging to him and his co-conspirators, the document says. Some of the money that Portillo took went to buy expensive watches and cars, the indictment says.